TIP: Need a resume? Click here to view our Resume Samples. As a manager, whether you manage human resources, sales, or people’s money, you’ve probably authored any number of memos, letters, and presentations, but your resume is different. Your resume is about you, and it shows how you stack up against the competition. If you do your research by examining manager resume samples, no matter what sector they represent, you’ll find there are desirable traits that are common to all managers. By reviewing the job description and resume samples that are readily available, you’ll be able to identify what the employer is looking for and how best to present your qualifications to meet that need. As you read further, you’ll learn what information to include, formatting options to choose from, and mistakes to avoid. If you’re wondering what to include in your manager resume, let the job description be your guide. Include the experience, skills and education the employer requires, but present that information in a concise and easy to read fashion. While the words you use are critical, a certain amount of white space on the page will make it more appealing to a resume-weary hiring manager than one with huge blocks of text. As you examine the manager resume samples available online, note that they can be easily scanned because each section is clearly delineated and none are overly wordy. There are two basic resume formats to choose from, and each serves a different type of job seeker. It’s up to you to define which works best for you. You can see examples of both resume formats as you search manager resume samples and decide which style will represent your work history and achievements best. Your resume summary is important for a number of reasons, not the least of which is because it’s the first part of your resume a potential employer reads. If you don’t draw them in, you could lose them before they have a chance to see how much you can contribute to their organization. A resume summary should be concise and to the point. Try to define your skills and accomplishments in an action oriented description with quantifiable results. And do it in three sentences or less. Human Resources Manager with over 10 years experience in the manufacturing sector who has successfully completed union contract negotiations without work stoppages occurring. Developed and maintained diversity program and ensured conformance to EEO regulations. With oversight of recruitment programs, interviewed, hired, and monitored career-pathing of employees, which resulted in an increased retention rate of 23 percent. Construction manager responsible for the construction, renovation and maintenance of 120 unit condominium property. Completed environmental and engineer reports and ensured all necessary permits were obtained to avoid fines and penalties. Estimated scope of work and obtained at least three bids for each job. Reviewed all invoices and regularly inspected property and units for compliance with specifications, budget and schedule. If you haven’t yet decided which resume format chronological or functional is right for you, take another look at the manager resume samples in each style. There’s no single best format, so you have to decide based on your work history and career path which will allow you to present your qualifications in the best light. If you’re going with the chronological style, list your previous jobs with the most recent first. Each job is its own sub-heading, comprised of company name/location, period of employment, and job title. It’s how you list your accomplishments beneath the job that counts. By creating 3-6 bullet points that begin with action verbs and, if possible, end with quantifiable results, you’ll catch the eye of a potential employer and allow them to see you in action and as a part of their organization. You’ll also have the opportunity to show clear career growth from job to job. The functional style allows you to focus on your achievements without linking them to a specific employer. By inserting an “Accomplishments” section, you can list your attributes and achievements together, and by referring to what the employer has identified in the job description as important, you can mirror their needs. There should be a minimum of 6-8 bullet points written similarly to the ones in the chronological style. Recommended applicant tracking system that reduced recruiters’ time spent reviewing resumes by 40 percent. Initiated product knowledge classes, which improved sales by over $500K the first year. Reviewed bid proposals for both cost and material ensuring quality workmanship on each project. Once you’ve provided your workplace skills and achievements in the accomplishments section, you can move on to the work experience section, which will be a simple list of previous jobs. If you quickly scan the manager resume samples you’ve already identified for verbs, you’ll likely find more that may apply more directly to your business sector. While there are many desirable skills in a manager, the best way to prioritize them is to refer to the job description. If the employer lists certain skills as requirements and you can claim them, make sure they’re listed first. You want them to see what they’re looking for. Check the manager resume samples you’ve already identified for formatting suggestions, but in general, you’ll want to use bullet points or columns to list the items in this section. As for the kind of skills to list, first include those technical skills desired by the employer, followed by any other technical skills you can bring to the table. For example, construction managers may be familiar with CAD, and 2D and 3D modeling, and even if they’re not mentioned on the job description, they should be listed under technical skills. Since so many management skills are similar no matter what the industry sector, a review of the manager resume samples could suggest skills you have but may not have considered. Depending on your business sector, whether it’s construction management, financial management, or one of the many other management sectors, the educational requirements are usually a combination of at least a bachelor’s degree plus relevant experience. In some instances, a master’s is required. Before you apply for any job, make sure your meet the educational requirements on the job description. As you list your education, put the highest level attained first. The only information the potential employer needs at this point is the school attended, school location, and degree obtained. The formatting should be simple, but since there are a few options, it’s best to review the manager resume samples for a format that best suits your style. Since many business sector managers have the option to be certified by an industry organization, it’s a good idea to create a sub-heading called “Certifications.” HR Professionals receive various certifications, like the Professional in Human Resources (PHR) certification from the HR Certification Institute; Financial Managers receive a Certified Financial Manager (CFM) from the Institute of Management Accountants; and Construction Managers receive Construction Manager (CM) certification from the Construction Manager Certification Institute. If you have certification in your business sector, list it. If not, it’s a good idea to explore what it would take to become certified in your industry. If you begin the process, you can list it on your resume as long as you correctly identify it as “in progress.” It could make the difference in a competitive job market. Don’t say they’re available upon request if you haven’t identified them and gotten their approval. The best references are previous managers or directors to whom you reported, and in some cases, clients with whom you have a strong relationship. While you may be familiar with word processing tricks like embedded tables, fancy fonts, and inserted graphics, don’t use them on your resume. Many companies are now using applicant tracking systems (ATS) which are easily confused by seemingly basic formatting devices. Regarding the use of keywords and their importance in getting past an ATS and into the hands of a human being, it’s critical to pay attention to the words used in the job description and to mirror them in your resume. It’s a fact of life that you not only need to craft a well-written resume, but you need to do it in a way that satisfies a possible ATS. Save the first-person pronouns like “I,” and “we,” for your cover letter. Your resume is a more formal document and should be concise and to the point rather than conversational. Save that tone for your interview. As a manager, you’ve probably seen sloppily written memos that contain typos and grammatical errors that took you out of the document you were reading. To avoid that happening with your resume, proofread, proofread, and proofread again. Having a friend read you resume before you submit will help identify mistakes you simply can’t see in your own writing. Construction managers are expected to see employment growth of 16 percent for the same period, which is faster than the average. Population and business growth along with the need to improve infrastructure are expected to spur growth, and technology and environmental regulations will drive increased employment of construction managers. Employment of human resources managers is project to grow at 13 percent. As new companies emerge and established ones expand their operations, human resource managers will be needed to oversee and administer programs like the Affordable Care Act. A Master’s degree and certification will provide an edge in the job market. Financial managers are expected to be employed at a growth rate of 9 percent for the 2012 to 2022 period, but it will vary by industry. The demand for activities of planning, directing, and coordinating investments will continue to grow as the economy grows. Sales managers are expected to be employed at a growth rate of about 8 percent, and will depend largely on the growth of the industry where the perform. Business-to-business sales are expected to be stronger than business-to-consumer sales. Offshoring of these positions is unlikely. Highly energetic and professional Manager with 11 years career experience. Versed in marketing and public relations and staff development and supervision. Desires a challenging role as a Manager where exceptional communication and customer service skills can contribute to a growing organization. Design marketing materials and develop strategies to increase sales and product recognition. Supervise pricing and inventory policies and functions to ensure competitive pricing and achievement of projected gross margin. Generate reports and keep board apprised of departments’ initiatives and activities. The Paper and Ink Co.
Ensured regulatory compliance company-wide through regular inspections of equipment and OSHA workplace safety courses. Interfaced with suppliers customers and corporate management and fostered positive company image through participation in community events and activities. Prepared and reviewed marketing plans with employees to ensure accountability through clear expectations. Developed annual budget and reviewed with staff prior to year’s end. Hired trained and developed staff; held weekly meetings to discuss department goals and deliverables. Created wage scale and employee incentive programs to increase individual performance. There are plenty of opportunities to land a Manager job position, but it won’t just be handed to you. Crafting a Manager resume that catches the attention of hiring managers is paramount to getting the job, and LiveCareer is here to help you stand out from the competition. Managers run the show. So how can you craft a resume that is a show stopper? Start with a strong summary statement. In your statement, describe your professional persona in a few sentences, using adjectives that describe you. For example, driven manager, personable manager, or results-oriented manager are strong descriptors that will help to establish your personal brand. In your skills section, focus specifically on your leadership talents by detailing related accomplishments. Use managerial words like budgeted, administered, and managed at the beginning of each bullet point. 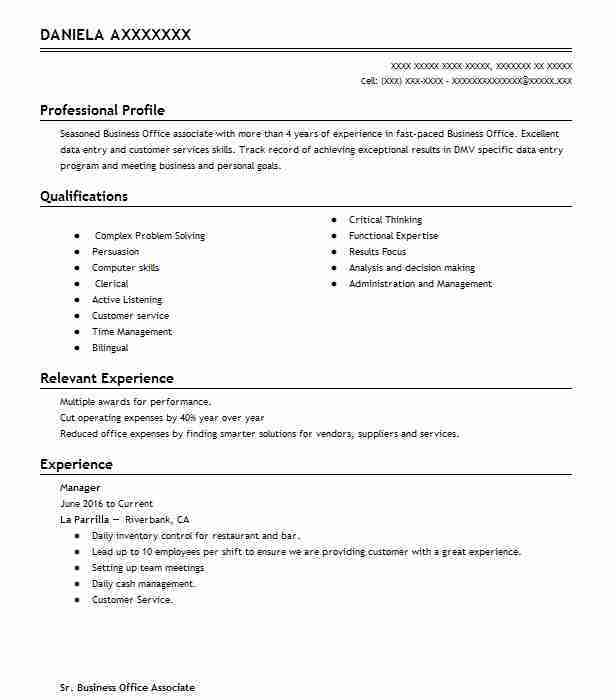 Take a look at our manager resume example to learn more about excellent resume writing. Are you a born leader? A manager position could be right for you. The manager-specific resume examples below can help you create the compelling resume you’ll need to land the leadership position you want. 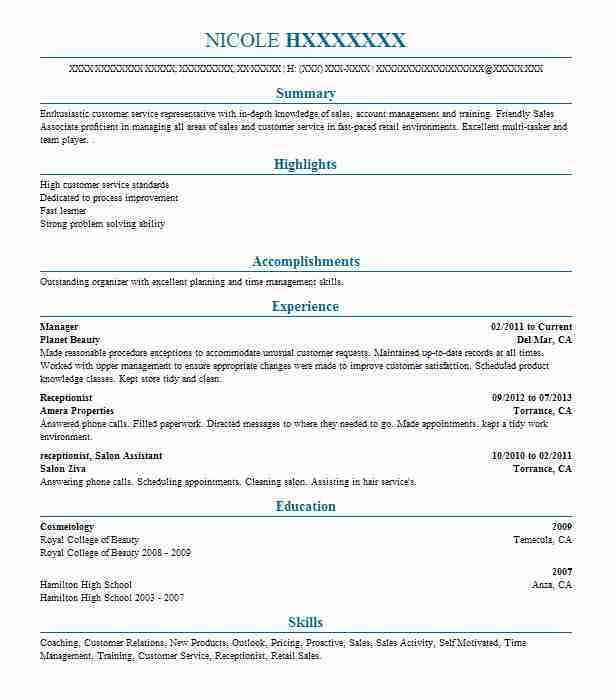 Use these resume examples and their pre-written text samples as a starting point, then edit your resume to fit your individual needs. Land the job sooner with a stand-out resume–get started right now. Finding jobs as a manager requires research and an understanding of job availability in the area. Following these simple tips may help you find the right job for your skillset and experience. 1. Be persistent. Finding jobs as a manager is rarely easy, but with persistence and creativity you may be able to find a job that you would otherwise overlook. In addition to regularly checking local job boards, be sure to branch out and utilize every job-search tool at your disposal. This includes word-of-mouth inquiries and social networking. 2. Build your online presence. This will help potential employers find you and learn more about you, since 45 percent of employers now use social media to screen potential employees. If you don’t already have a professional Facebook, Twitter or LinkedIn profile, take a few moments to create one. 3. Update your resume. There are plenty of online resume-building tools that can help you leverage your abilities and experience to increase your chance of being considered for jobs as a manager. 4. Know your occupational options. Whether you have been recently laid off or you are simply looking for a new professional opportunity, become familiar with local job options. You can choose to look for a job in an industry with which you are familiar, or you may wish to branch out to an entirely new occupation. Do some research to find out what types of jobs are available in your area and would be a good match for your skills and personality. 5. Be open to getting help. There are organizations and counselors that know how to help job seekers find opportunities in their area. If you are having trouble finding a job, be open to approaching your local job center for assistance. 1. Keep your resume to just one page if possible, but don’t get distraught if you simply cannot list all of your experience on one page. A resume that is up to two full pages in length is acceptable. 2. Never lie on your resume in order to seem more experienced. 3. Use bullet lists in your resume to make it more reader-friendly. 4. Avoid using personal pronouns such as me and I in your resume. 5. List your jobs in chronological order, with most recent jobs first. A manager at a salon, spa or gym performs the duties of an administrator, a boss, a custom service liaison, and more, so be sure to include any applicable professional experience. For this role, highlight your past management experience, including experience with hiring, training and coaching staff, or experience managing budgets and sales development. Be sure to mention your education as well as all of the current licenses you hold, such as an esthetician or spa license. 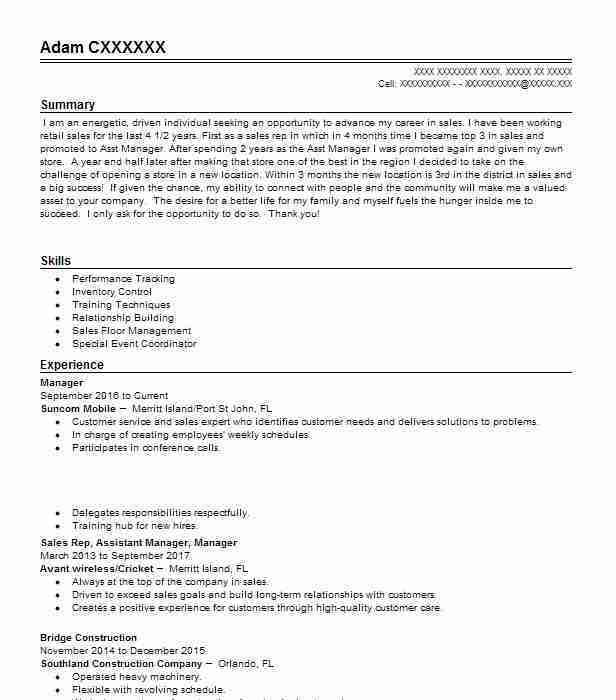 See our manager resume example for more ideas on how to get your resume in top shape. A manager at a massage clinic, gym or health spa needs to be an administrator, a boss, a custom service liason, and much more. You’ll also need a compelling resume that highlights your experience in the industry. The resume examples below should help show you what you might want to include. Click on any of these resume examples and take the next step toward a resume that will help land you the managerial position you want, faster. Searching for jobs as a manager can be a bit stressful, just as job hunting anywhere else in the United States can be a bit of a challenge. However, by keeping a few key things in mind throughout various stages of the application process, anyone can work to make their search less stressful and more productive than ever. 1. Be sure to search for positions in every nook and cranny. Sometimes available jobs are overlooked due to lack of exposure or advertisement. 2. Make a plan. Knowing which options are viable for an applicant’s skillset can help to narrow the field drastically and produce better results. 3. Produce a clear and concise resume which correctly portrays experience and skills to potential employers. 4. Take advantage of classes which offer applicants the opportunity to sharpen their interviewing skills and improve resume writing. 5. Never hesitate to attend local job fairs. Taking this initiative can reveal a great deal about the local job market as well as open doors for employment opportunities. Experience and education can make a great deal of difference when searching for jobs as a manager. However, the thing that can make the most difference is the creation of a professional and polished resume. When it comes to creating these documents, there are certain qualities which many employers seem to agree are necessary. 1. Always check for spelling mistakes, along with errors in other mechanics. Errors in these fields can oftentimes make an applicant seem lazy or generally sloppy. 2. Always list included work experience or education in reverse chronological order so that the most relevant information can be seen first. 3. Include appropriate and professional-sounding contact information, especially where email addresses and voicemails are concerned. 4. Do not include references directly on the resume, as it is usually unnecessary and takes up valuable space. 5. A resume should ideally be 1-2 pages long, with the 2 pages reserved for those with extensive experience in the relevant field.